Actor Suriya, who is well – known for his passionate and hardworking nature celebrated his 40th birthday with his friends and family. The star who has proved that hard work will always be fruitful and has also made his presence felt in Indian film industry. The talented actor is said to have had a blast with his loved ones and a specially customized cake was cut by the 'Singham' actor. 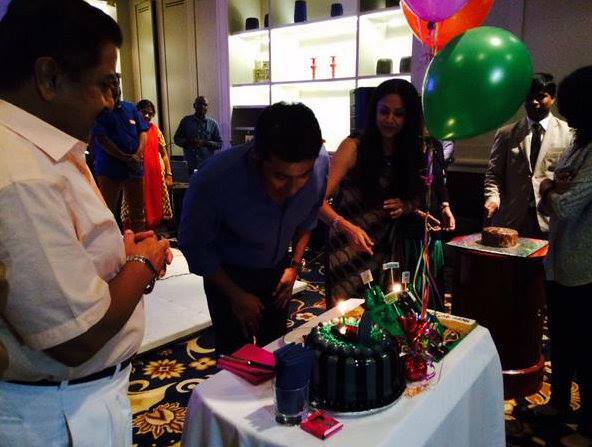 Interesting pictures of Suriya's birthday celebrations are doing the rounds and Jyothika and Sivakumar are seen next to the birthday boy in the bash. Suriya joined Twitter few months ago and the star has been showered with loads of warm wishes on his birthday from his colleagues, friends and fans. The versatile actor has films like 'Mounam Pesiyadhe', 'Nandha', 'Kaakka Kaakka', ' Pithamagan', 'Perazhagan', 'Vaaranam Aayiram', ' Ayan', Singham' , '7 aam Arivu' to his credit and is currently occupied with '24', 'Haiku', 'Singham 3' and an untitled Tamil- Telugu bilingual. It is to be noted that apart from acting, Suirya is serving the society through Agaram Foundation and many less- fortunate students are being benefitted through this foundation.